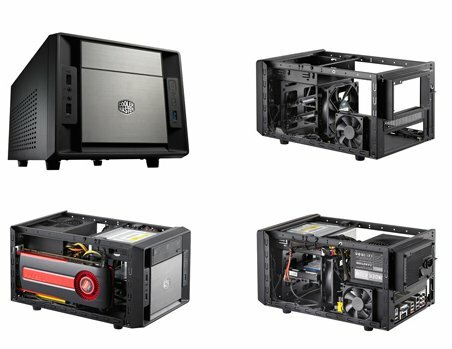 Cooler Master reveals a new $49.99 (44.95EUR) compact case; the Elite 120 Advanced. It will ship towards the end of July. Cooler Master, an industry leading chassis, thermal solution, and peripheral solution provider is proud to announce the all new Elite 120 Advanced. The Elite 120 answers the call for an elegant MITX size chassis that supports the best hardware available. A modern solution for the space conscious, the Elite 120 has been designed for high performance with an attention to detail. Elite 120 Advanced is the most compact, yet fully featured chassis for MITX applications. An understated, brushed aluminum front panel shelters a powerful 120mm fan intake. Cooler Master engineered the Elite 120 Advanced to fit in the most diminutive of spaces with the absolute maximum supported hardware. A pleasing, conservative design belies the true performance contained within the Elite 120 Advanced. Offering no compromises, Elite 120 Advanced is marked as the benchmark for a brilliant internal layout. Feel confident with a long 13” of graphics card space – supporting virtually all of the longest graphics cards. An easy to use rear PSU bracket, adapted from the Cosmos 2, allows Elite 120 Advanced owners to easily install long power supplies. Three 3.5” hard drives bays and a 5.25” optical bay round out its full system support. Elite 120 Advanced also offers best in class cooling – including a 120mm front intake, 80mm slim side fan, and additional support for a hard drive mounted 120mm fan. Highly compatible with components, spacious and elegant, the Elite 120 Advanced also maintains Cooler Master’s reputation for value. Cooler Master brings enthusiast-level standards to the MITX segment. A black interior with black cabling keeps cable management classy. It includes full functionality of 2 external USB ports with an additional front mounted USB 3.0 port. Dust filtered intakes and exhaust reduce maintenance. While other chassis in its class trade size for performance and cost for features, the Elite 120 Advanced delivers no compromise by providing the most modern features at an attainable price. Elite 120 Advanced offers better support and great value for users.